Discussion in 'Guitars' started by Lois Lane, Mar 19, 2019. If you use a plectrum (guitar pick to others), which have you been favoring lately. If you want, we can also talk about finger picking and pick technique. There are brands of picks that will probably be not heard of by some and so this might be a nice way to broaden all our horizons. I have just lately been experimenting with different thicknesses. When I started playing about 48 years ago I bought many different sizes, big triangles, tiny, tiny ones, super thin and super thick, red ones, white ones, black ones and brown ones and I even got one of those dyes to cut my own out of old credit cards and the like (horrible). I then began using Fender medium picks although dispising them as they would become jagged after just a short time, but just kept buying them as pretty much all picks were the same to me. But, hurray, Jim Dunlop started making a better product, and so for the past maybe 20 years or so had been using orange Tortex 50mm..until now. Blue Chip Picks are bloody expensive. I thought that they must be kidding themselves to sell a plectrum for $35-$70 (depending on thickness) and that they were profiting off of a person's vanity and expectations, sort of like someone buying a $100 usb cable and hearing more clarity compared to the $15 variety (which of course is bogus and the fodder of other threads I am sure). Wrong! They are very expensive because the material that they are fabricated of is a Dupont plastic called Vespel (https://www.professionalplastics.com/VESPELSP1-DUPONT) which happens to have two properties that are wonderful for playing the guitar, namely that it is self lubricating and that it doesn't seem to wear to me at all. I have found that there is effectively zero drag on the string which to me which is very apparent when using any other plectrum that I have. I have a TD40 which has a 1.00mm thickness. I find it just phenomenal and will get another in case I ever misplace the one I have which I am extremely careful of. I must have 40 ot 50 other picks in my pick box, but now only use this one. I am blown away, in love and can never go back to my old relationship with those orange Tortex. Been playing Dunlop Jazz III (red) since I started. Can't play as well with any other pick, most of them are just too soft and bendy. I do use some thinner, softer picks for acoustic and clean guitar playing because it gives a more open sound. Also, a green D'Addario Duralin for playing bass. Dava Picks and never looked back. I'll to pick one up to try. I never have up to this point as 1) never knew anyone that had used one of them, and 2) they seemed like a "we built a better wheel" type of thing. Thanks for the nod in that direction. Which kind do you use, Delrin, Nylon or their Poly material? Oh yea, a link to Blue Chip Picks. I have no financial interest in them though I have become quite a fan. Jim Dunlop Tortex normally 73mm for heavy GTR stuff and bass and a bit thinner ones for acoustic and my strat ( as i run 9's on that). They really make a difference in the sound. It's like eq'ing your acoustic. I like having the grip surface. I'm a pick dropper, haha. $50 plecs eh? Could I interest you in some magic beans? I have tried many picks over the years and I always go back to the Fender medium. They just work for me. Good enough for the Pixies is good enough for me. My favorite is orange for electric, and green for bass. That is exactly what I thought before I used one and now I cannot use one of another material, I find them that different. The way the pic comes off of the string with no drag is quite spectacular compared to everything else I have used. I thought that I was kidding myself so lined up all the different plecs on my thigh and switched through them one at a time. I would have preferred a blind test but they all feel different gripping them in my fingers and so that couldn't work for my personal test. The tone to my ear allows the tone of my Martin guitars to shine through, and using Monel strings I am happier now than I have ever been. Playing electric I am still on the Orange Tortex though. I will guess that you live in Europe, most probably in England if you are calling them plecs. 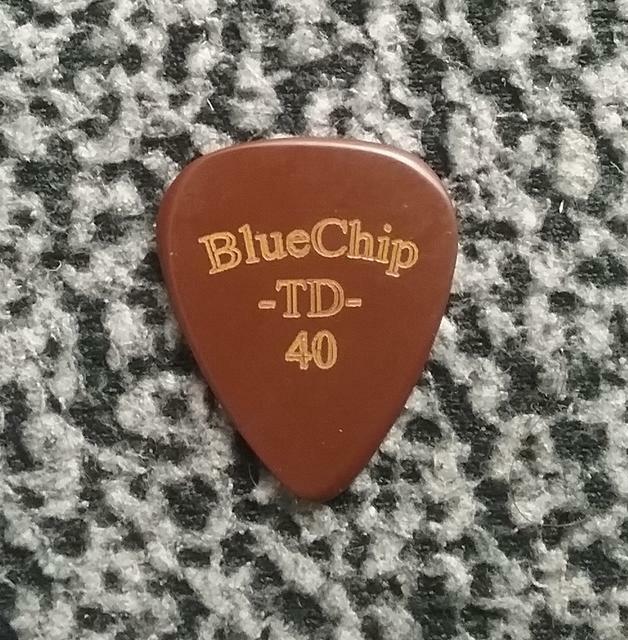 Thing is, Blue Chip will let you try a plec and take it back if you don't like it. They are very cool about giving one the opportunity to spent what might to most be stupid money on something that normally at most for a regular plectrum is a couple of Dollars, Pounds, Rubbles, Euros or the currency of your choice. The sad thing is that to Europe they charge an insane postage of something like over 20 Euro for shipping which soured me to the experience, but I have family to whom I had it shipped in the States who then put it in an envelope for $1.20 which made my experience fine and dandy. Here is a link to JP Guitars, a store in Bristol (if indeed you are in England) that might have a return policy. If you are not in England they have a store finder that might have a dealer in your country. Alternate picking...sweep picking...strumming...metal rhythms...Doesn't bend and not too thick where u can't feel the strings.. I still use the Orange myself on electric, on acoustic it is the Blue Chip on most of my guitars, that is, all the dreadnoughts, but on the jumbo and parlor I still use the Tortex. The Pixies have always been a favorite band of mine too. And it is purple...which is a good thing! Secret of BlueChip picks REVEALED! Researchers have discovered that the patent pending material used in BlueChip picks is a bio-engineered substance that transfers endorphins through the skin of the player to produce a euphoric response. Playing a guitar holding a BlueChip pick with bare fingers consistently resulted in irrational exuberance reported by the guitarist. In contrast, the tests results revealed that when playing with a BlueChip pick held with surgical gloves where endorphin transfer is blocked, the guitarist is left unimpressed with the sound of the pick, coupled with noticeable symptoms of buyer’s remorse. 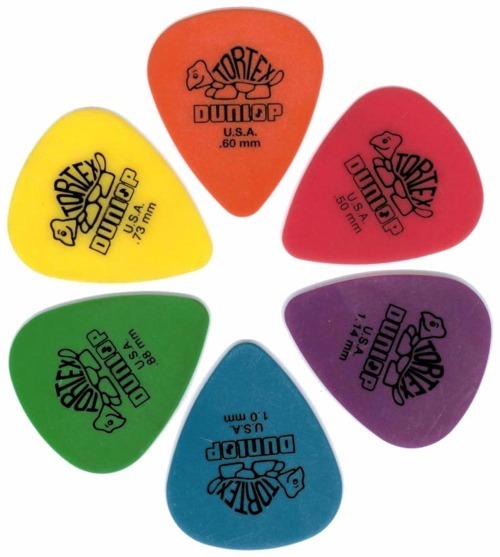 To validate the results, researchers strapped BlueChip picks against the foreheads of subjects, and asked them to evaluate their guitar sound using other picks formed of various materials, including celluloid, delrin, stone, nickel, steel, and taro root. Regardless of the material, the subjects were convinced it was the best sounding and feeling pick ever, and demanded to know where they could pay fifty bucks to obtain one. Researchers have speculated that wearing a headband lined with BlueChip picks would lead a guitarist to experience satisfaction in even the most dubious musical circumstances, such as playing an Ovation or listening to Dave Matthews. Related testing revealed that other pick manufacturers have also incorporated psycho-mechanical substances, but to a less dramatic effect. For example, users of Wegen jazz picks become inclined to wear berets and drink herbal tea, while over time Fender celluloid pick users develop a nagging urge to customize their vans. BlueChip representatives have not responded to queries regarding this research. Has anyone tried these Clayton Frost-Byte Standard?